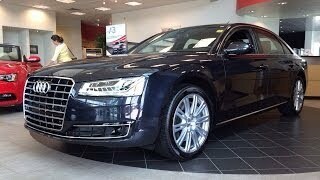 The newest version of Audi A8 unlike its previous versions undoubtedly stands at as a fully groomed competitor. The Audi A8 2015 is loaded with more attractive headlamps and with more efficient features in Drive trains. The curiosity raised and we decided to take a closer look at this model and find out the reason behind the appreciation it is getting. With its two models in series Audi A8 and Audi A8 L, we found ourselves much inclined towards the L model, as it offered five inches of overall length and additional wheelbase. To be mentioned specifically we found the specifications of Audi A8 2015 interesting and before here presenting the descriptive review, we would take you to a brief outlook of the Specifications it offers to its buyers. 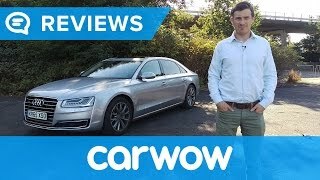 Calling the new Audi A8 2015 as the Geek’s limousine won't be wrong, its features like wireless internet, night vision and Bang Olufsen sound. Basically 2015 Audi A8 has everything which you’d expect to get at this price range. The 22- way power front seats, LED headlamps, and blind spot monitors are some of those features which will pop your eye out your skull. 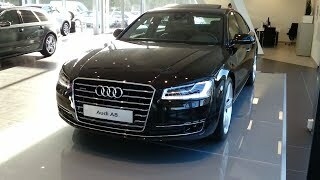 Let us see more of such feature new 2015 Audi A8 is offering to its buyers. The energy Audi A8 team conserved at the exterior part of model has been well utilized in the interiors. The A8’s cockpit doesn’t miss a single aspect of perfection, a perfect blend of wood, leather, aluminum or plastic. Being loyal the finishing confused us, we truly are not sure of what they used to bring the style and what they didn’t. To add more to the Wow factor of Audi A8 review is that the Audi has been modeled with the throttle lever, yes we are talking about the one you find in yachts and powerboats. In all the interior of Audi A8 2015 is a commendable step and will definitely give the sigh of satisfaction to those not much excited by the exterior of Audi A8 2015. Exterior of Audi A8 2015 comes with the same classy traditional executive look. You won't find much of entertaining and eye popping additions into it. This definitely comes as a fall back but it can be presumed that the stylish new features in the inside and the add on to its performance will definitely invite some of the new car buyers to team Audi. The Aluminum space frame gives a lighter side to the segment, as a result providing an impeccable help in improving the car’s handling and persistently saving a lot of fuel in the process, or saying a ‘lot of fuel’, if you have chosen the turbo diesel engine. The Audi A8 makes you experience the sure footed feel with its Quattro all-wheel drive. In all the 2015 Audi A8 performance on streets will definitely prove to be a remarkable experience for you. Audi A8 2015 comes with specifications, making it a great competitor for Mercedes Benz S Class and BMW 7 series.